Dave Freer’s DOG AND DRAGON is a sequel to DRAGON’S RING (reviewed here). As such, it’s about the further adventures of Fionn, the black, shapechanging dragon (also called Finn), his lover, Meb (née Anghared), and their devoted sheepdog, Dileas. At the end of DRAGON’S RING, everything was thrown into flux. You see, Meb believed that if she stayed with Finn, something awful would happen to the universes — the various planes of existence — and that Finn, in trying to save them (as that is, indeed, his job), would end up dead. That’s why she leaves Tamarind and ends up in Lyonesse, the place of her birth; while she hadn’t intended to go there, her magic tends to send her wherever she’s most needed. And Lyonesse, it turns out, is in major need of a heroine. Meanwhile, Finn and Dileas are searching for Meb. Searching the various planes isn’t as easy as it sounds, even for a shapechanging dragon like Fionn/Finn; fortunately, Dileas is an excellent tracker, and despite the fact that Meb’s translation from Tamarind to Lyonesse was nearly instantaneous and didn’t go by way of the planar travel Finn and Dileas are forced to endure, Dileas ends up getting them in the right direction. Back in Lyonesse, Meb makes common cause with the only decent people around, the formidable Lady Vivien, a widow, and the young noblewoman sent to become Meb’s maid, Lady Neve. But both women are being blackmailed — more or less — by Mage Aberinn, a man who’s kept Lyonesse in thrall for the past fifty years. And because of this, Meb has difficulty figuring out how to become Lyonesse’s predestined “Defender” — who, as it might be expected via prophecy, will defend the land from villains such as Aberinn. Now, why is Aberinn such a bad guy? Simple — he’s kept Lyonesse at war with six or seven other planes of existence by way of something he calls “the Changer” for most of the past fifty years. And when people can’t grow crops due to the constant warring — when people can’t be safe in their own homes — well, it’s a situation that’s good for Aberinn because the people are scared and cowed. But it’s an appalling situation for everyone else. Worse yet, there’s another figure — a shadowy presence — encouraging the constant warring in Lyonesse. So between this shadow-person and Aberinn, Lyonesse is in bad, bad shape, which is one reason why it’s such a depressing place to live. To Meb’s credit, she understands that the constant warring has caused major problems nearly immediately and vows to do something about it. But she has few allies; Vivien feels compelled to stay where she is due to her two young sons, while Neve just can’t do much. Never fear, however; there are other allies on Lyonesse, such as the knockyan (called “knockers” by humans), a type of dwarf akin to the previous book’s dvergar, there are the ant-like muryan, there are spriggans, and of course there are pixies. All of them eventually end up aiding Meb in repelling any number of invaders, merely because Meb can’t help being what she is — a very powerful mage who comes from this odd world and has strange links to it by birth — and while it’s good that Meb gets aid, perhaps some of that aid comes to her a bit too easily. Really, the better part of the story here lies with Finn and Dileas; they have all sorts of adventures. Bad things happen to them, or at least are attempted, and most of them are rebuffed with humor and/or forethought — but despite Finn’s near-immortality and near-invulnerability, I never got the sense that things happened too easily for Finn and Dileas, especially as they had to work really hard to find Meb in the first place. Overall, DOG AND DRAGON is a really cute story, and the adventures Finn and Dileas have are fine and funny. But is it up to the rousing action-adventure of DRAGON’S RING? No. And are Meb’s adventures as interesting as the ones experienced by Finn and Dileas? No, they aren’t, precisely because everything seems to come just a bit too easily for her — something that did not happen in DRAGON’S RING — and because I couldn’t help but get the sense that despite all of her Defending, she really was there for one plot purpose and one plot purpose only: to wait for Finn and Dileas to find her. Granted, had DRAGON’S RING not been so outstanding, I may have been happier with this adventure. But DRAGON’S RING was and is outstanding, which is why I really expected more here — and I didn’t quite get it. That said, this is still a cute story and I enjoyed Finn and Dileas’s adventures. Meb’s a good character, too — I liked her, even though I thought Lyonesse was a rather depressing place and that most of the people there were obnoxious at absolute best — and I’d like to see more adventures for all three of them. 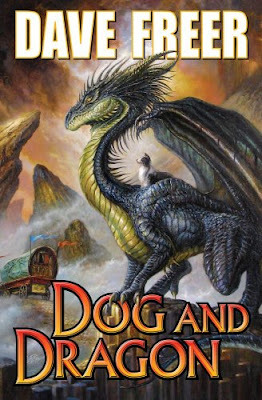 In other words, DOG AND DRAGON is a strong B-plus — nothing to sneeze at, mind you, and a book that I enjoyed quite a bit (especially when Finn and Dileas were “on stage”) — but not quite up to the standard set by DRAGON’S RING. "Dog and Dragon", Dave Freer, epic fantasy, sequel to "Dragon's Ring"